I have real trouble passing a good bookstore. Days like yesterday are why. I didn’t start out the day intending to visit the Battery Park Book Exchange and Champagne Bar, and certainly didn’t want to get champagne there. But Esta and I were parked nearby and it seemed a shame not to go in. 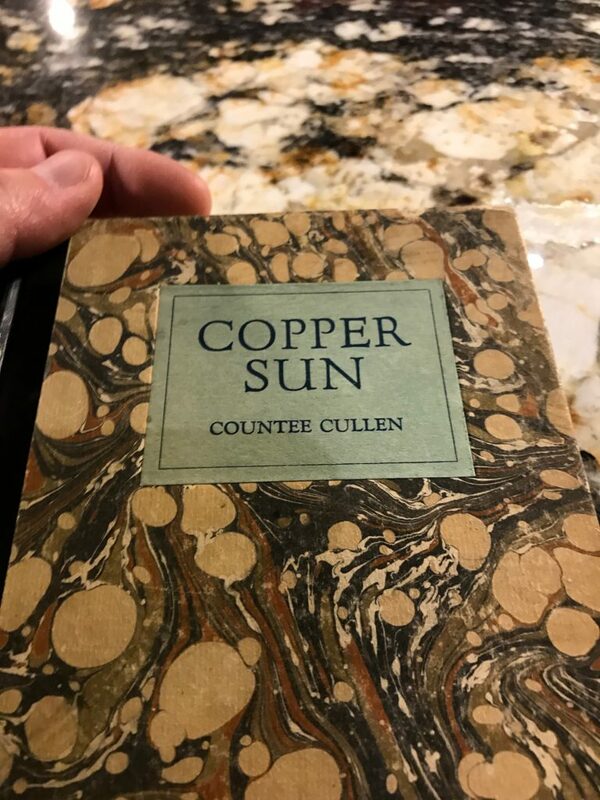 And Countee Cullen‘s Copper Sun (1927), pictured above, his third published book. The Cullen is a beautiful work, illustrated in an art deco inspired style by the unrelated Charles Cullen, and featuring some of Countee Cullen’s most shattering poems, including “Threnody for a Brown Girl.” A Google search shows that first editions can go for north of $300; I got very lucky to find it for less than a tenth of that.